the perfect setting for an unforgettable wedding. 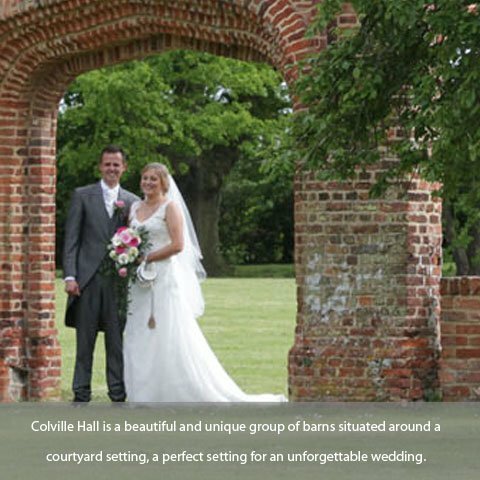 full of charm and steeped in history "
Colville Hall is a unique venue for your special day, providing the romance and history of bygone years with its courtyard of listed thatched barns around a central manor house. Colville Hall is located in the lovely village of White Roding on the Hertfordshire / West Essex border, Chelmsford is 11 miles away to the East and Harlow is 9 miles to the West. Bishop Stortford is located 7 miles north. When planning a picturesque wedding at Colville Hall, you deserve a room that is equally as beautiful. As newlyweds, we want to help you set the tone for a long and happy marriage. Our luxurious Bridal Suite lets you start married life perfectly with a large king size bed for the happy couple to fall into at night. Colville Hall has an exclusive partnership with three catering companies to provide an exquisite dining service for your special day. When you book your wedding with Colville Hall you will work side by side with our dedicated wedding planner to choose the right menu for you and your guests to suit your budget.